Two budget interface announcements from TASCAM building on the rugged designs offered by the previous generation of models. 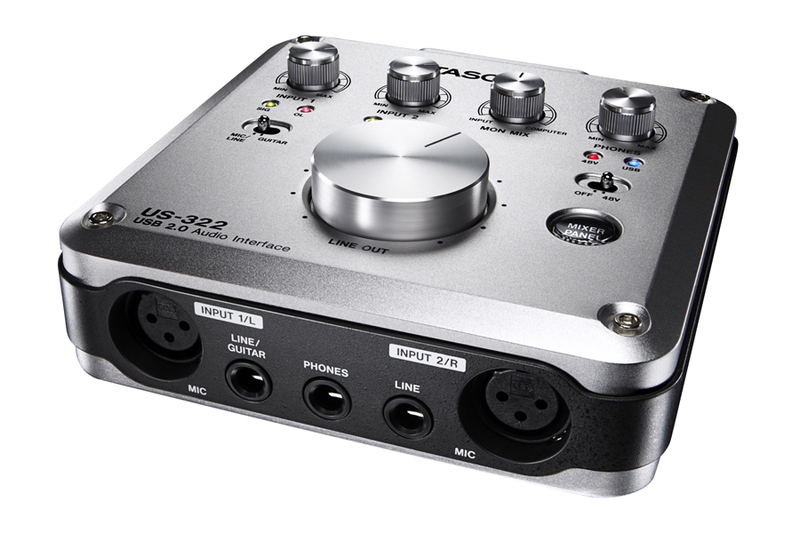 The US-322 and US-366 are the next line of interfaces from the leading professional and home recording manufacturer, TASCAM. These interfaces combine compelling new technologies like on-board digital mixers (DSP Mixer) and on-board digital effects (DSP Effects) along with advances on the wildly popular US-122mkII and US-144mkII interfaces. The US-322 and US-366 sport similar aluminum casings for the same rugged reliability plus new improved HDDA (High Definition Discrete Architecture) mic pres. These HDDA Mic Pres offer a wider frequency response (10Hz to 68kHz), high S/N ratio (98dB), low EIN (-120dBu) and low THD+N (0.0045%); qualities rarely achieved in interfaces this affordable. These all-new interfaces boast low S/N ratio, low THD and the US-366 flaunts 24bit/192kHz recording; certifying these as the best sounding interfaces to be released by TASCAM yet. 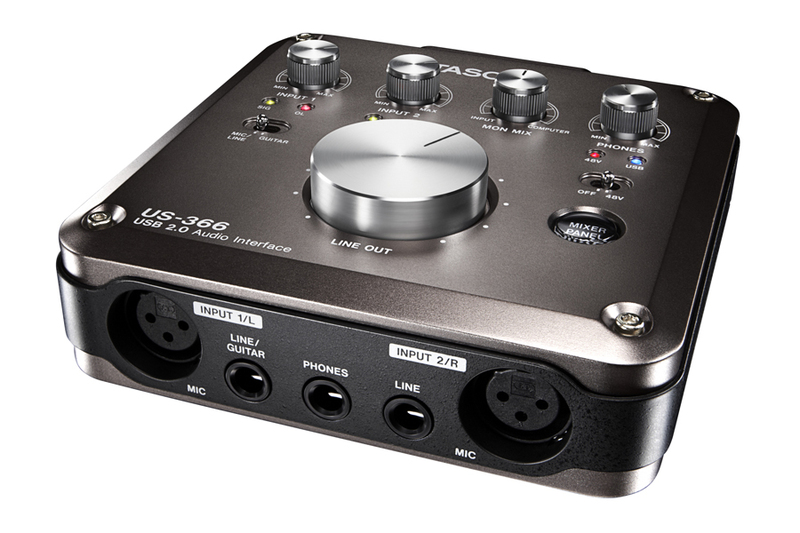 The 2-in/2-out US-322 features 1 Mic XLR/Line-Guitar TRS input, 1 Mic XLR/Line TRS input, 2 Line TRS and 2 Line RCA outputs. The 6-in/4-out or 4-in/6-out US-366 adds 2 Line RCA inputs and 1 Digital RCA/Optical input/output. One click of the top-loaded “Mixer Panel” button will access TASCAM’s new mixing console screen and on-board insert/send effects for easy-to-use, versatile recording. The digital mixer offers two operational modes, multi-track mode and stereo-mix mode. Mixer panel provides users intuitive operation on PC for sound mixing and activating effects. MON MIX volume provides easy operation for adjusting level balance from external devices and PC. Output selector for each output; selectable between internal mixer output and PC sound. 2 balanced XLR microphone/TRS line inputs. L channel can be switched to Guitar Input for high-impedance support. 6-in/4-out or 4-in/6-out USB interface depending on the setting of line 3 and line 4. REMOTE connector: The DAW transport can be controlled by an optional remote controller, RC-3F: foot switch. Another interesting announcement from Korg as they take their classic MS20 synth, shrink it almost 20% and re-issue it again after 30 years! A VSTi version of this synth cropped up a few years back with a mini controller also in this vain but this synth is a standalone monster just waiting for you to get to grips with all it’s loverly controls once more. Today, the sounds of the MS-20 have been reborn as the MS-20 Mini. The same engineers who developed the original MS-20 have perfectly reproduced its circuitry and fit into a body that’s been shrunk to 86% of the original size, yet retains the distinctive look of the original. The MS-20 mini painstakingly replicates the original MS-20. A development team led by the original engineers themselves worked to recreate the original circuitry, and when it was necessary to substitute a part, these engineers made the decisions based on careful listening, in order to reproduce the original sound faithfully. In fact, the sound of the MS-20 mini has a somewhat bright and extreme quality to it because its sound is that of an original MS-20 in mint condition at the time it went on sale, before any of the components aged. The MS-20 mini reproduces the distinctive synthesis of the MS-20; two oscillators with ring modulation, and envelope generators with hold and delay. The VCA maintains the basic design of the original, but it’s been modified to produce less noise than the original. One of the greatest characteristics of the MS-20 was its powerful filters, which provided resonance on both the high-pass and the low-pass. Maximizing the resonance would cause the filter to self-oscillate like an oscillator, producing a distinctive and dramatic tonal change that was acclaimed as inimitable, and was later used on the monotron and monotribe. The filter circuit was changed mid-way through the production lifecycle of the MS-20; the MS-20 mini uses the earlier filter, which was felt to be superior due to its more radical sound. The ESP carries on the experimental spirit of MS-20; it allows you to use the pitch or volume of an external audio source to control the synthesizer. For example you can input an electric guitar and use the MS-20 mini as a guitar synthesizer, or input a mic and use it as a vocal synthesizer. The patching system provided to the right of the panel lets you create complex sounds by plugging-in cables to change the connections between the various units. The possibilities are limited only by the user’s imagination; different combinations of the modulation input/output and trigger, sample and hold, and noise generator can produce an incredible variety of sounds. By patching according to the MS-20 flow chart that’s printed on the panel, even the beginner can start taking advantage of these possibilities right away. Korg have unleashed a new VA synth of epic proportions in the shape of the KingKorg. A full sized 61 key, 3 OSC synth, with Korgs own newly developed XMT modeling sound engine. XMT (Xpanded Modeling Technology) is proprietary Korg technology that was created in order to produce a broad range of sonic variations while keeping operation simple. In a conventional synthesizer, the sound-creating process requires you to adjust the oscillator settings one by one, making it difficult to see the overall picture. In contrast, KingKORG provides pre-set algorithms that contain combinations of various types and numbers of oscillators, letting you easily and quickly sculpt stage-ready sounds. The wide range of oscillator algorithms includes the choices you’d expect from an analog synthesizer–sawtooth wave, square wave, and noise–in addition to numerous PCM/DWGS algorithms, giving you plenty of scope choices for creating highly personal sounds. Other key features are 3 effects sections on the master allowing you to apply effects from a choice of 6 different effects, filters modeled upon classic Korg filter sections and a vacum tube section to add overtones and some extra drive and all this is constructed around a virtual patch system ensuring that you should have plenty of ways to help you sculpt your sound. KingKORG features a 3-oscillator x 2-timbre design allows you to generate thick and rich sounds, plus a newly developed XMT modeling sound engine. XMT (Xpanded Modeling Technology) is proprietary Korg technology that was created in order to produce a broad range of sonic variations while keeping operation simple. In a conventional synthesizer, the sound-creating process requires you to adjust the oscillator settings one by one, making it difficult to see the overall picture. In contrast, KingKORG provides pre-set algorithms that contain combinations of various types and numbers of oscillators, letting you easily and quickly sculpt stage-ready sounds. The wide range of oscillator algorithms includes the choices you’d expect from an analog synthesizer–sawtooth wave, square wave, and noise–in addition to numerous PCM/DWGS algorithms, giving you plenty of scope choices for creating highly personal sounds. While designing KingKORG, extreme attention was paid to the filter section, which is crucial to a synthesizer’s character. A diverse variety of filters is a unique advantage of analog modeling, and KingKORG’s filters add unparalleled flexibility. In addition to a variety of essential analog modeling filter types, you get faithful models of filters that reproduce the analog monophonic synths used for lead and bass in the ’70s, the polyphonic synths used in new wave music of the ’80s, and the filters of Korg’s classic MS-20 analog synth. These filters can also be made to self-oscillate by raising the resonance setting– a unique capability of analog synthesizers. KingKORG provides three master effect sections, each giving you a choice of six effect types: PRE FX, with types such as distortion and amp simulator; MOD FX, with classic effects like phaser, chorus, and tremolo; and REV/DELAY, with ambience effects such as hall reverb and modulation delay. Each effect processor has a dedicated front panel dial that selects the effect type. To choose the ideal effect type, simply turn the dial to hear the result, and use the FX control knobs located below these dials to adjust the effect as desired. KingKORG provides a full-analog vacuum tube driver circuit as a mastering effect. You can use it to add warm fullness, a powerful overdrive, or anything in between. The built-in vocoder uses audio from the onboard mic input to modify the sound, creating an effect as though the synthesizer were talking. The vocoder features Formant Shift to dramatically modify the tonal character, as well as Formant Hold, which allows you to “freeze” a vowel sound and play it back using the keys. Thanks to the KingKORG’s dual-timbre architecture, you can even combine the vocoder with another timbre, either as a complementing sound or a modulation source. On many classic synthesizers (such as the MS-20), the signal flow could be reconfigured using patch cables to physically connect one element to another. KingKORG reproduces this function with an intuitive Virtual Patch system. With six Virtual Patch assignments per timbre, control signals such as EG, LFO, or joystick movement can be virtually connected to sound parameters such as pitch or cutoff, allowing you to modulate a parameter for even greater sound-shaping possibilities. The step arpeggiator automatically generates an arpeggiated phrase (broken chord) according to the chord you hold on the keyboard. You can choose from six arpeggio types, and specify the duration, interval, and on/off status of each step to enjoy a wide variety of performance possibilities. 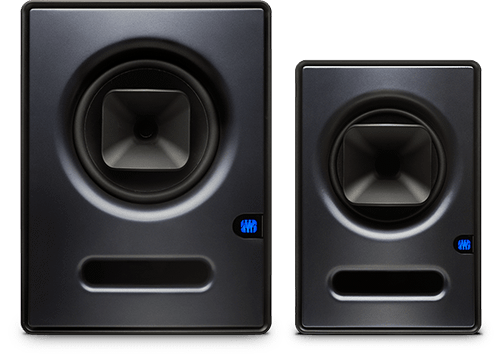 PreSonus announces the Sceptre CoActual™ series studio reference monitors. Featuring an advanced coaxial design that works integrally with a 32-bit, 96 kHz, dual-core processor using Fulcrum Acoustic’s TQ™ Temporal Equalization technology, Spectre CoActual monitors deliver clarity and coherence that has previously only been available in ultra-high-end systems. Yet they are an affordable investment for project-studio owners—a first for DSP-controlled, TQ-based systems. The series includes two models. The Sceptre S8 CoActual Studio Monitor features combines an 8-inch low/mid-frequency driver and a 1.73-inch (44 mm), horn-loaded, high-frequency transducer into a single coaxial unit with aligned voice coils. The Sceptre S6 CoActual Studio Monitor’s coaxial speaker integrates a 6.5-inch low/mid-frequency driver and a 1.34-inch (34 mm), horn-loaded, high-frequency transducer. Both models have acoustic ports. Through intensive collaboration with Fulcrum Acoustics’ Dave Gunness, PreSonus software designers were able to incorporate Fulcrum’s Temporal EQ algorithms employing multiple, fully addressable Finite Impulse Response (FIR) filters. Gunness was also responsible for final tuning and voicing of both Spectre-series monitors. Sceptre monitors include controls that enable full integration into any studio environment. A four-position Acoustic Space switch controls a second-order shelving filter center at 100 Hz, with four attenuation settings (no attenuation, -1.5 dB, -3 dB, and -6 dB) so that you can account for the bass response relative to room dimensions and speaker placement. A High Pass switch sets the second-order slope, 12 dB/octave filter’s low-frequency cutoff to linear, 60 Hz, 80 Hz, or 100 Hz. A High-Frequency Driver Adjust switch adjusts the tweeter’s overall level to linear (0 dB), +1 dB, -1.5 dB, or -4 dB. The Sensitivity control ranges from +4 dBu to -10 dBV. The systems are biamplified: Each transducer is powered by a 90W RMS, Class D power amp with an internal heat sink. All Sceptre-series monitors have a balanced XLR and ¼-inch TRS line-level inputs with A-taper level control. 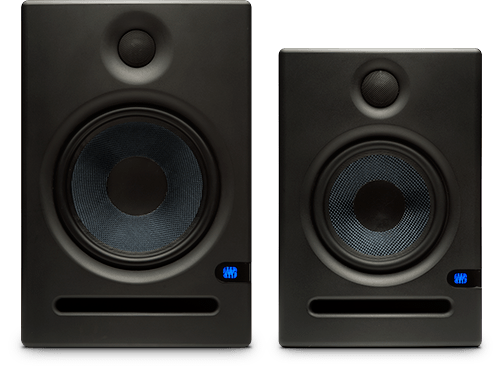 PreSonus today unveiled its new Eris™-series studio reference monitors. These ultra-affordable, 2-way, bi-amped monitor speakers are designed to deliver accurate response with a tight bass and very clear upper end. They can also be user-adjusted to the acoustic space, allowing you to create a more accurate listening environment or to simulate different common listening environments – a feature not typically provided by studio monitors in this price point. The Eris E8 features an 8-inch, Kevlar low-frequency transducer, driven by a 75 watt, Class D power amplifier; and a 1-inch (25 mm), silk-dome, high-frequency tweeter with a 65W, Class D amplifier. It can deliver up to 105 dB SPL, peak. Frequency response is rated at 45 Hz to 22 kHz. The compact Eris E5 sports a 5.25-inch, Kevlar low-frequency driver, mated with a 45W, Class D amplifier; and a 0.79-inch (20 mm), silk-dome tweeter powered by a 35W, Class D amplifier. It can crank out a clean 102 dB SPL, peak. Frequency response is rated at 64 Hz to 22 kHz. Both Eris models have individual balanced XLR and ¼” TRS input connections in addition to unbalanced RCA inputs. Both offer RF shielding, current-output limiting, over-temperature protection, and subsonic protection. Users also can make several types of custom adjustments. A four-position Acoustic Space switch controls a second-order shelving filter, centered at 100 Hz, that provides three attenuation points (no attenuation, -2 dB, and -4 dB), allowing you to control the bass response relative to the wall proximity of your speakers. A High Pass switch sets the low-frequency cutoff (second-order slope, -12 dB/octave) to be flat, 80 Hz, or 100 Hz. You also get continuously adjustable High Frequency and Midrange controls from -6 dB to +6 dB. 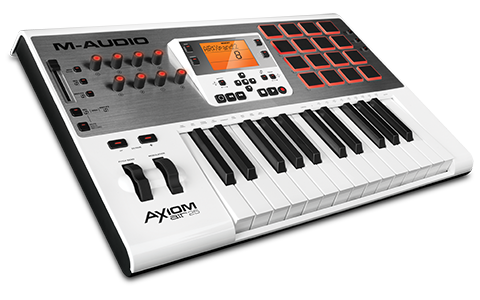 Along with the new Axiom controllers announced at NAMM the newly re-vitalized M-Audio introduce us to a hat trick of new interfaces too. Offering three distinct models, the M-Track Series combines a robust feature set with extreme ease of use to create versatile audio/MIDI interfaces for every level of musician. range of inputs, outputs, and connection options designed to work efficiently in the modern studio or on the go. Simple controls, effective metering, and rugged chassis make the M-Track Series ideal for withstanding the rigors of day-to-day use. 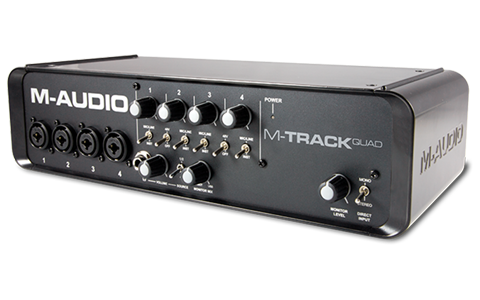 From the entry-level M-Track to the pro-line M-Track Quad, each model offers a reliable platform that can accommodate the myriad of devices that can come and go in a changing project studio. 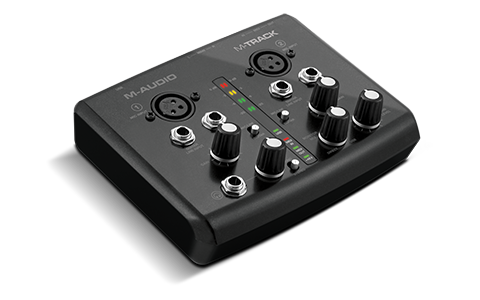 selectable 48V phantom power, 1/4″ line inputs with guitar-level switching, and per channel audio inserts. A second set of outputs operates independent of the monitor level control, providing extra versatility. At home in the more advanced digital studio, the step-up M-Track Plus is built on the M-Track’s foundation, with the addition of coaxial S/PDIF digital input and output jackson the back panel and a robust metal casing. This entry-level model offers two-channel operation. Each channel provides both XLR and 1/4″ inputs. Phantom power (48V) and guitar-level switching are provided. Professional audio converters and discrete preamp design deliver up to 24-bit, 48 kHz digital audio for use with virtually any software. 4-segment LED metering and multiple status lights provide real-time visual feedback. A single USB cable provides both power and data, making setup a snap. Intuitive controls include individual gain knobs, a convenient zero-latency mix knob, plus a headphone output with its own level knob. MIDI in and out jacks are provided, in addition to the balanced main 1/4″ outputs. 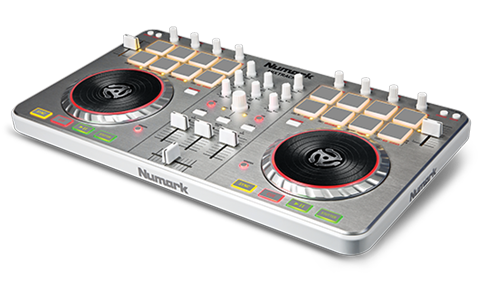 Here at Scan the budget friendly Mixtrack II and Mixtrack Pro II controllers from Numark have always been a popular choice for those just starting to get into mixing. Indeed we them so capable that our Dj tester in chief DJ Rasp has been known to do scratching master classes on these, which is pretty amazing that you can get something so fully featured for such a great price. 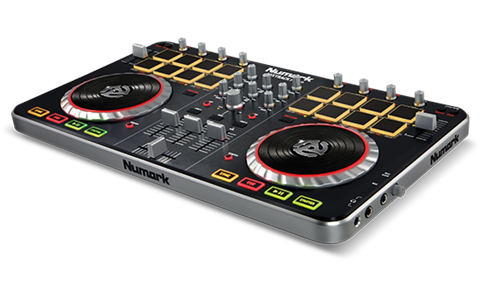 So we’re happy to see that the guys at Numark have refined and refreshed the two models. The Mixtrack & Mixtrack Pro II feature new streamlined designs and new expanded layouts of professional controls, including 16 backlit multifunction drum pads and illuminated touchactivated platters. 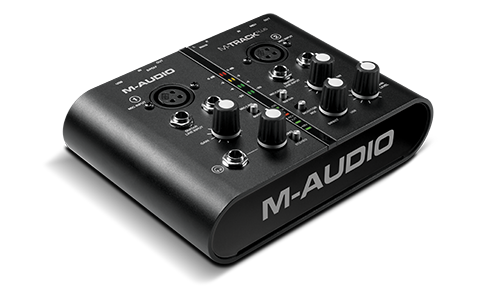 Hot cues, looping, and effects controls are all onboard, along with a built-in professional DJ audio interface. Building upon Numark’s longstanding partnership with Serato®, Mixtrack Pro II comes with Serato DJ Intro. DJs can also easily use Mixtrack Pro II with most popular DJ software, and it also comes pre-mapped for an optional upgrade to Serato DJ, the latest state-of-the-art professional software from Serato. Serato DJ includes a wide range of all-new features and capabilities, including stunning new effects powered by iZotope®, ultra-flexible and intuitive MIDI mapping, and the ability to set and trigger up to eight cue points. Now anyone who’s seen us at any shows around the country over the last few years will have seen Tom mixing it up using Wii controllers and showing off just how much fun you can have performing when your free to move about. 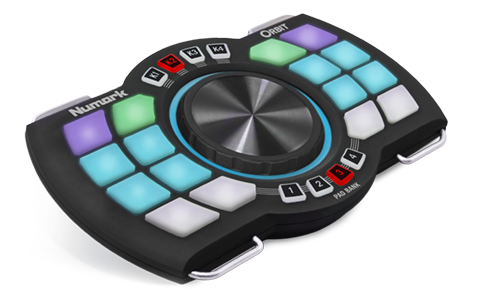 In the light of so many people trying it out by hacking other hardware out there its kind of surprised us that no one has developed a more simple solution that works over WiFi… well it seems like Numark has taken up the mantle with the Orbit. Whilst the design looks a little gamer like the big solid controls should make it very easy to use, even whilst having it on the dance floor yourself! The inclusion of the two axis accelerometer should give you some interesting options in regards to effect mapping and triggering and with a bit of tweaking we reckon this could be a really fun and pretty inspiring product. The MPX8 Sample launcher takes one of their controllers and adds the capabilites to load your own samples into the unit allowing you to use it for playback in a live situation. Using a standard SD card, users can load virtually any sample onto MPX8 and then assign it to any of the unit’s eight backlit velocity- and pressure-sensitive pads. 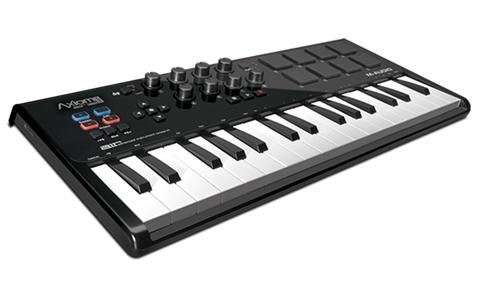 The MPX8 also comes with a large library of standard samples built in, which can be used for live performance in front of a crowd, on a radio show, or for in-studio production. Its bright blue backlit display and intuitive interface make for easy operation in any amount of light. 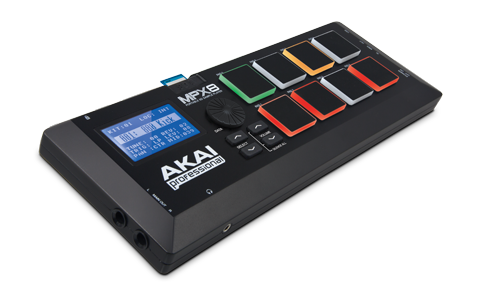 The Akai MPX8 features a 1/8-inch headphone output, two balanced 1/4-inch outputs, and five-pin MIDI and USB MIDI inputs and outputs are onboard. easy recall and even tune and add reverb to samples. 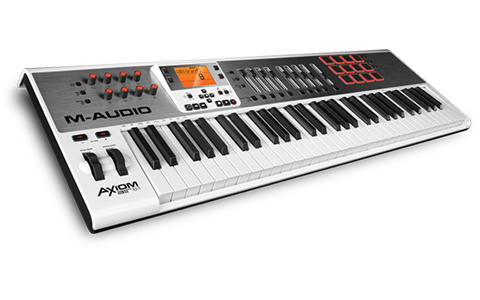 Another raft of controller keyboards, this time coming from the M-Audio camp bring us a complete refresh of their Axiom range. 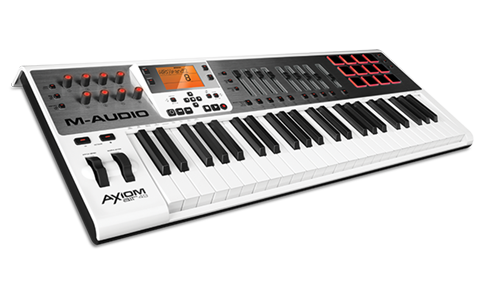 On top of all this inlike other keyboard controllers that include trial and demo versions of music software, M-Audio’s strong partnerships with AIR Music Technology and Avid® allow each Axiom AIR 61, 49 and 25 model to come complete with two exclusive and complementary music creation applications: Ignite by AIR and Pro Tools® Express from Avid. By removing many of the hurdles associated with computer-based music-making, Ignite delivers the most streamlined means to quickly capture your best musical ideas.